I’m going to create an FAQ for CameraGPS now that it’s becoming clearer what the most frequently asked questions are! The most frequent so far have all been around how it works when away from a good data connection. So here are few of the obvious questions. Please ask any more you have in the comments. Can I record trails when I have no data connection? Will I still be able to see the map when offline? 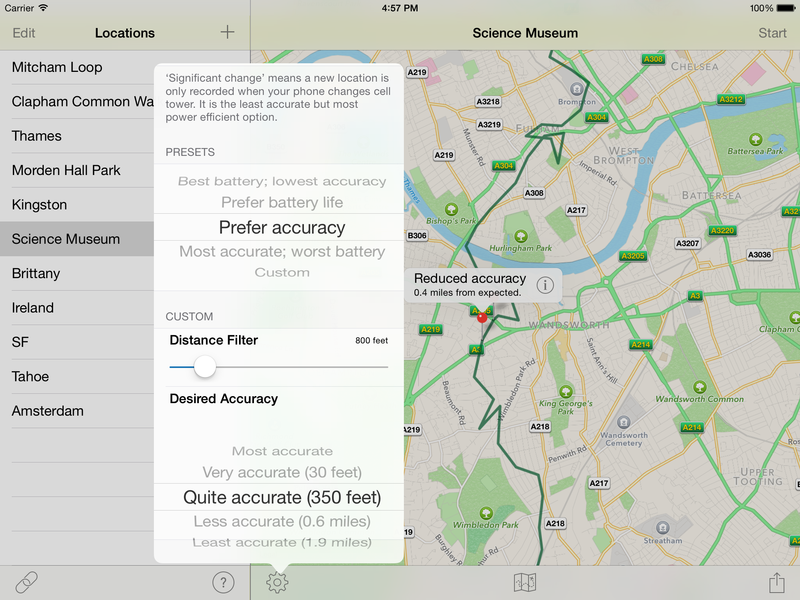 When you view a map on your iPhone, iOS remembers (caches) as much of the map as it can. So, if you look at a map and then switch on AirPlane mode, you will still be able to move around a little and zoom in. The same thing happens when you start a trail in CameraGPS with a strong data signal and then spend the rest of the day away from the cell network. Parts of your trail that were visible when you started the trail will probably be visible even when offline. New parts will not. Also, you won’t be able to switch views and expect to see it update. Your best bet at getting the most data available offline is to use the normal map view. As you would imagine, using the satellite view takes up more space. How big is this offline cache? The area available varies depending on a lot of factors, few of which you or I can control. To give you some idea, I was able to cache a lot of the Bay Area (the City, Berkeley, the southern part of Marin) when I was there a couple of years ago. Can I tell CameraGPS to remember bits of the map in advance so it will be available when I’m offline? As far as I know there is no way for me to do this. The best I can offer is suggesting that you view the area you’re planning on visiting shortly before you lose your data signal. Can I save to Dropbox or Box when offline? No. You should get an error message saying so. Is there anything else that won’t work? It won’t be able to copy your data to iCloud — though it will upload the data when you later get a data connection. And it won’t be able to correctly name any new segments of your GPX trail (you can see them in the “Options” screen). Again, it should fill in the gaps once you have a data connection.